A medical device having an implantable instrument configured to be implanted in bone tissue, the implantable instrument having an internal chamber configured to house at least one transducer; a transducer located within the internal chamber of the implantable instrument, the transducer configured to transmit a signal and to receive one or more reflections of that signal; and a signal processing system configured to process the signals transmitted and received by the transducer so as to provide information indicative of the acoustic impedance of matter in the vicinity of the implantable instrument after it is implanted into the bone tissue based on the signals transmitted and received by the transducer. 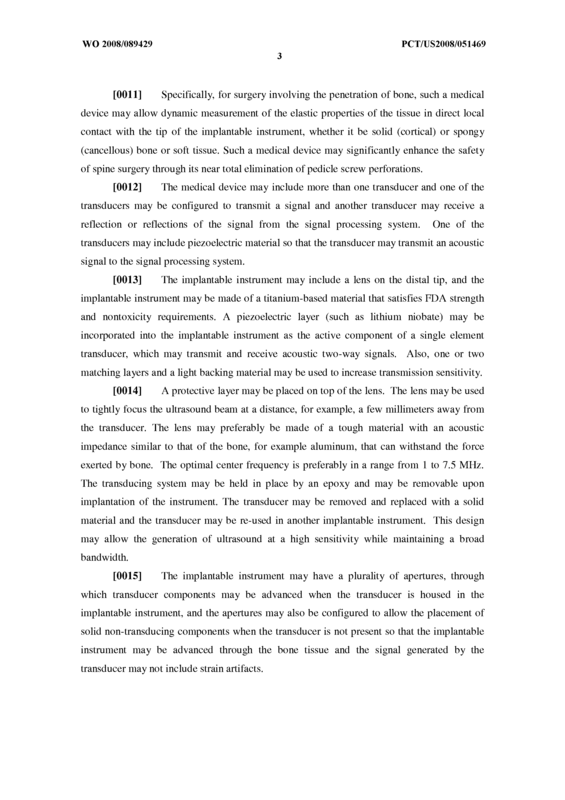 A medical device comprising: an implantable instrument configured to be implanted in bone tissue, the implantable instrument having an internal chamber configured to house at least one transducer; a transducer located within the internal chamber of the implantable instrument, the transducer configured to transmit a signal and to receive one or more reflections of that signal; and a signal processing system configured to process the signals transmitted and received by the transducer so as to provide information indicative of the acoustic impedance of matter in the vicinity of the implantable instrument after it is implanted into the bone tissue based on the signals transmitted and received by the transducer. 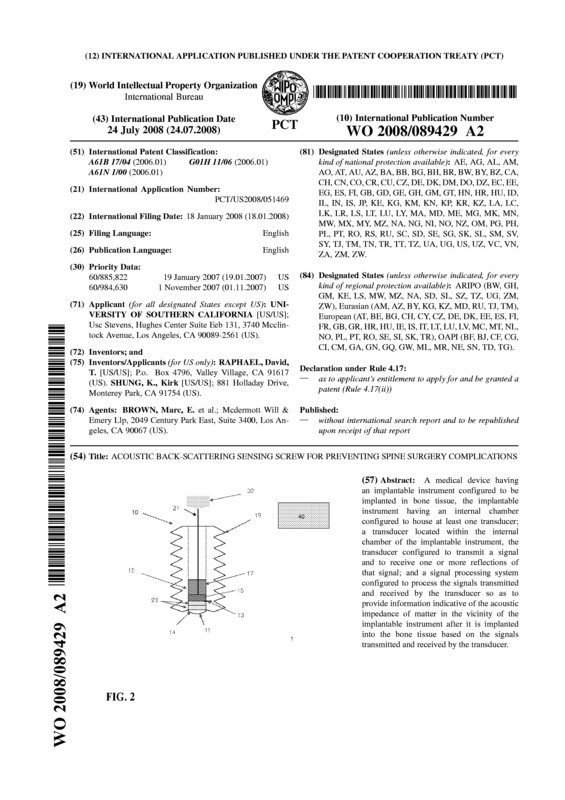 The medical device of claim 1 , wherein the transducer includes piezoelectric material. 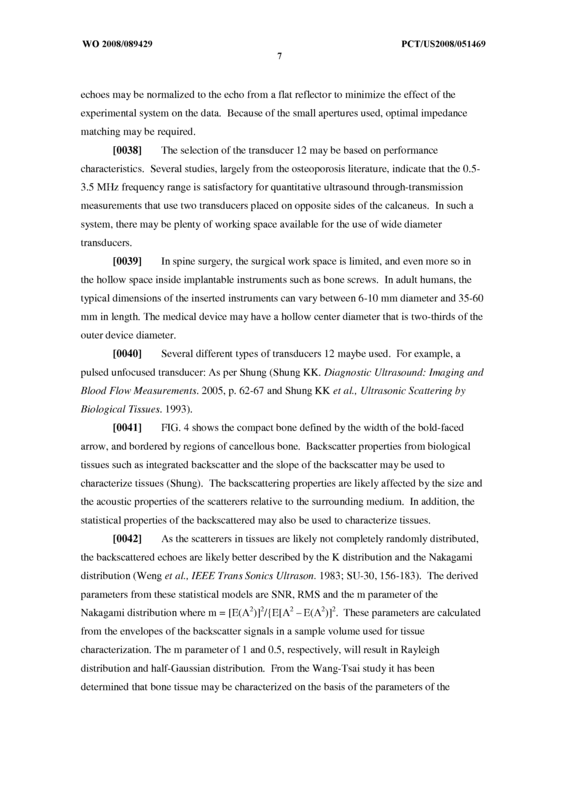 The medical device of claim 1 , wherein the transducer is an acoustic transducer. 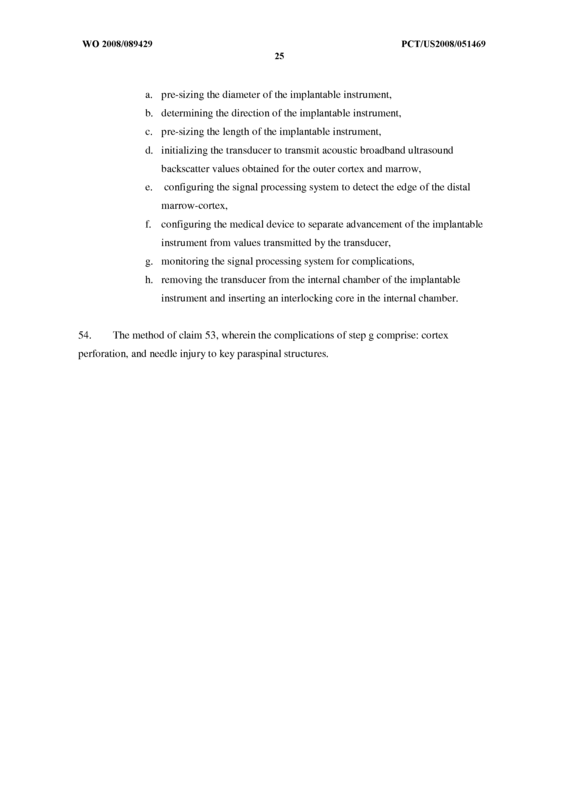 The medical device of claim 1 , wherein the medical device is configured to compensate for axial strain generated by bone tissue during advancement of the implantable instrument. The medical device of claim 4 configured to compensate for axial strain generated by bone tissue during advancement of the implantable instrument, wherein the implantable instrument includes a plurality of apertures at the distal tip of the implantable instrument. 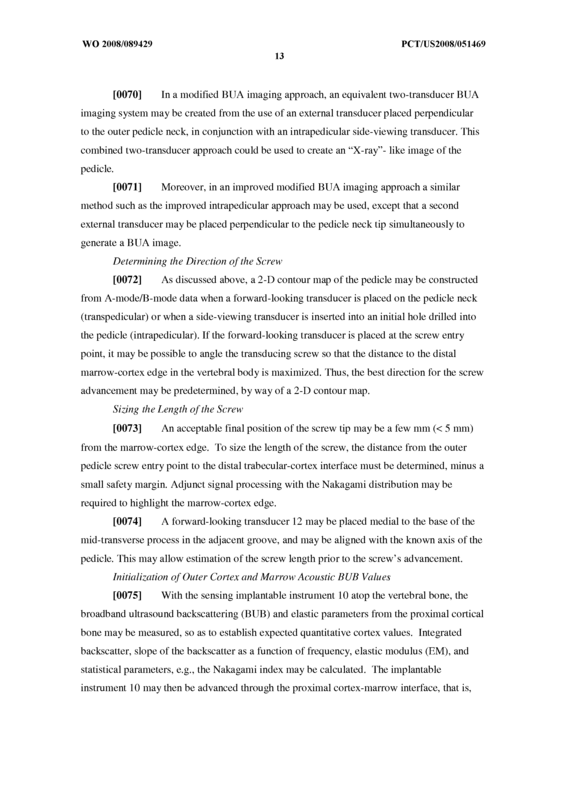 The medical device of 5, wherein the plurality of apertures are arranged to receive a plurality of removable needles upon advancement of the medical instrument through bone tissue; a plurality of needles configured to be aligned with the surface of the distal tip of the medical instrument. The medical device of claim 5 wherein the transducer is configured to be advanced through the plurality of apertures. The medical device of claim 1 , wherein the transducer includes piezoelectric material, a backing layer and one or more matching layers configured to increase signal sensitivity and a lens. The medical device of claim 1 , wherein the implantable instrument is made of a biocompatible material. The medical device of claim 9, wherein the biocompatible material is titanium. 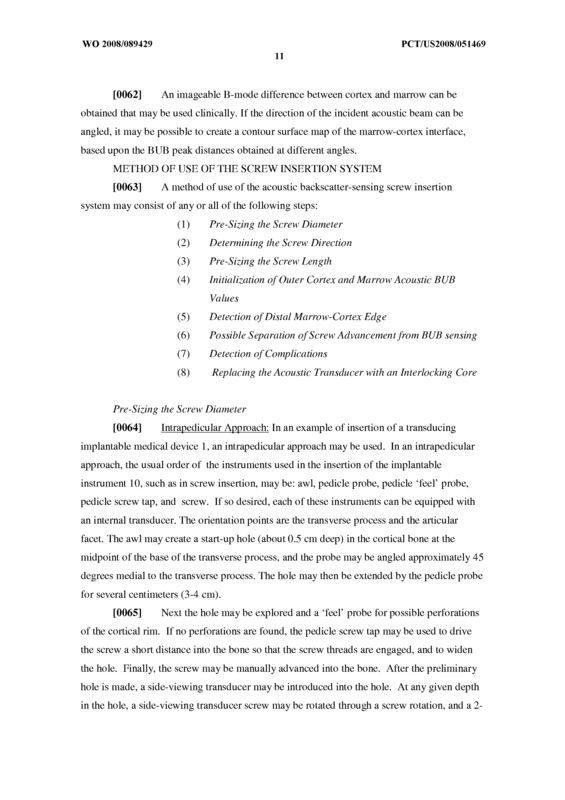 The medical device of claim 1 , wherein the signal processing system includes a communication device configured to communicate information indicative of the acoustic impedance of matter in the vicinity of the implantable instrument after it is advanced into the bone tissue, and a quantitative alarm configured to indicate the depth of the tip of the implantable instrument. 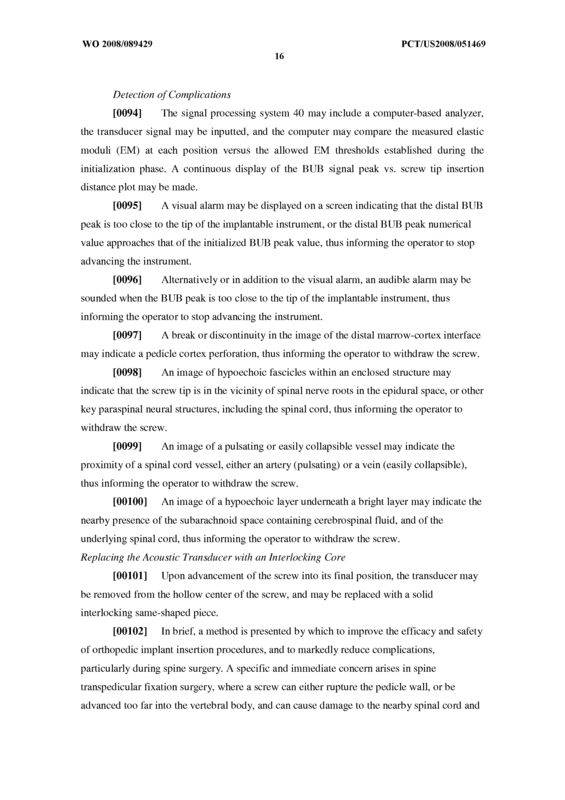 The medical device of claim 1, wherein the signal processing system includes a communication device configured to communicate information indicative of the acoustic impedance of matter in the vicinity of the implantable instrument after it is advanced into the bone tissue, and an alarm configured to indicate when the implantable instrument is approaching an undesired depth. The medical device of claim 1, wherein the implantable instrument comprises smooth external surface having a pointed tip configured to form holes in bone tissue. The medical device of claim 1, wherein the implantable instrument comprises a threaded external wall. 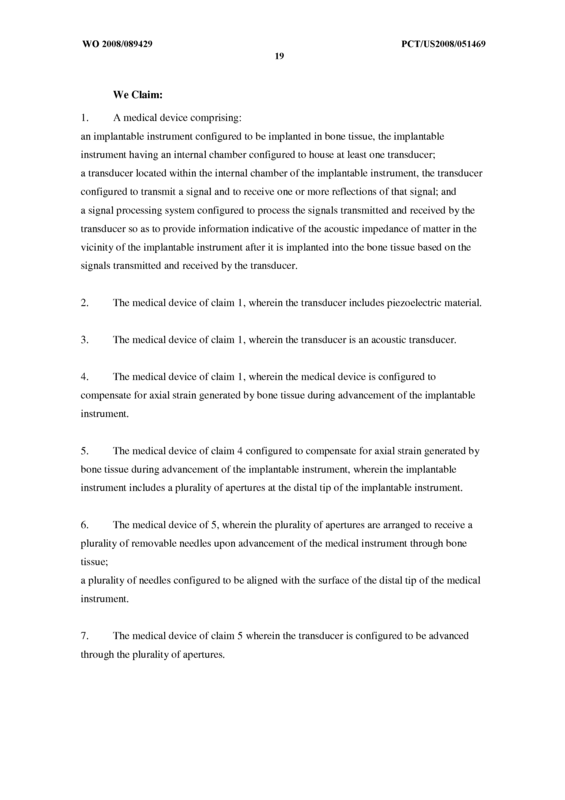 The medical device of claim 1 , wherein the transducer includes an array of transducers. The medical device of claim 15 wherein the array of transducers is configured to generate a focusable beam to generate simultaneous forward and side imaging. 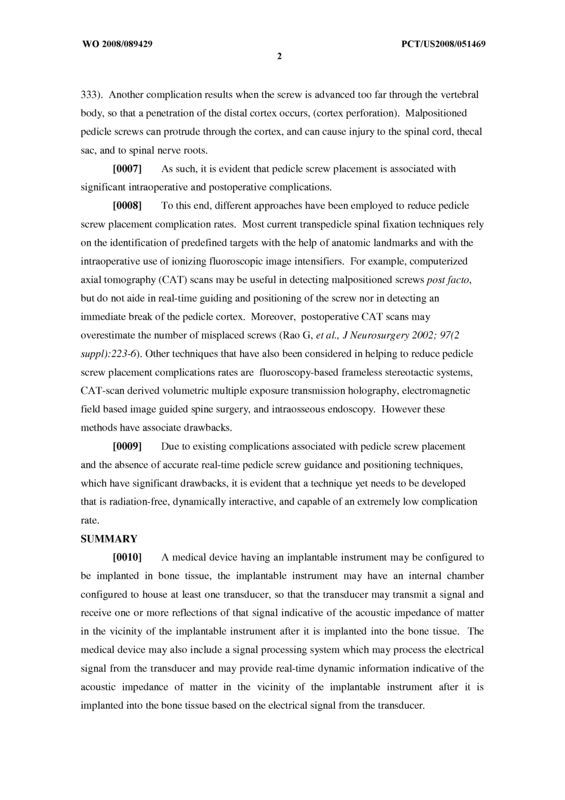 The medical device of claim 1 , wherein the transducer is configured to focus pulsed energy ahead of the tip of the implantable device to generate forward image of the surrounding bone tissue. 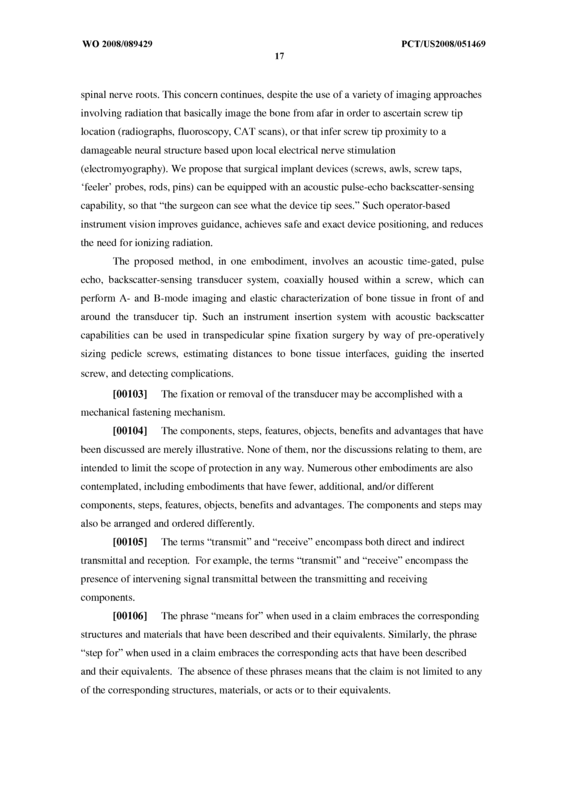 The medical device of claim 1, wherein the transducer is configured to focus energy to the side of the tip of the implantable device to generate an image of the surrounding bone tissue to the side of the implantable device. The medical device of claim 1 , wherein the transducer is configured to transmit a signal between 0.5-3.5 MHz. The medical device of claim 1 , wherein the transducer is configured to be removed from the internal chamber and replaced with a solid cylindrical mass. 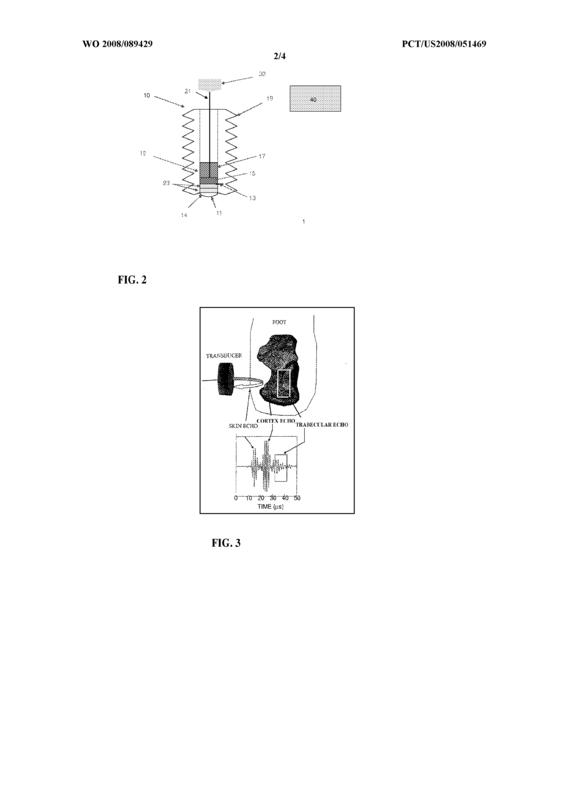 A medical device comprising an implantable instrument configured to be implanted in bone tissue, the implantable instrument having an internal chamber configured to house a transducer. The medical device of claim 21, wherein the internal chamber of the implantable instrument includes a proximal and a distal end, wherein the proximal end is configured to channel an electrical lead from the transducer, and the distal end is configured to house the transducer. 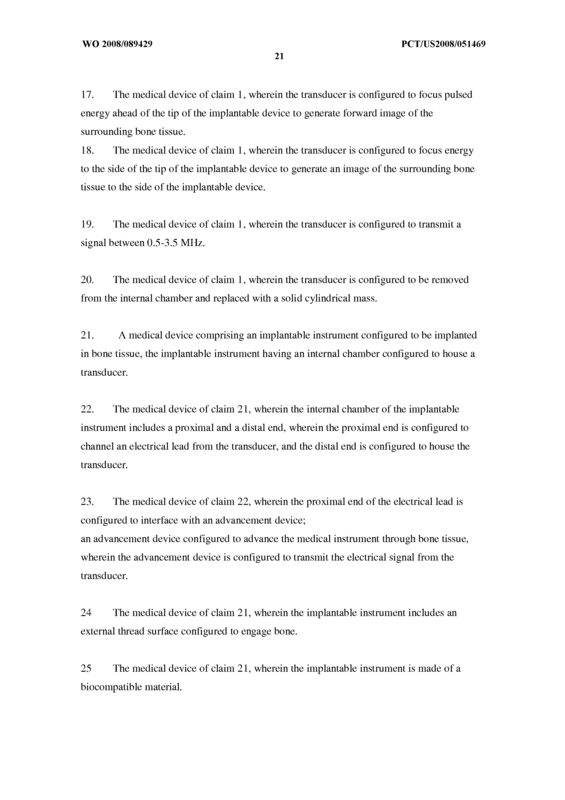 The medical device of claim 22, wherein the proximal end of the electrical lead is configured to interface with an advancement device; an advancement device configured to advance the medical instrument through bone tissue, wherein the advancement device is configured to transmit the electrical signal from the transducer. 24 The medical device of claim 21, wherein the implantable instrument includes an external thread surface configured to engage bone. 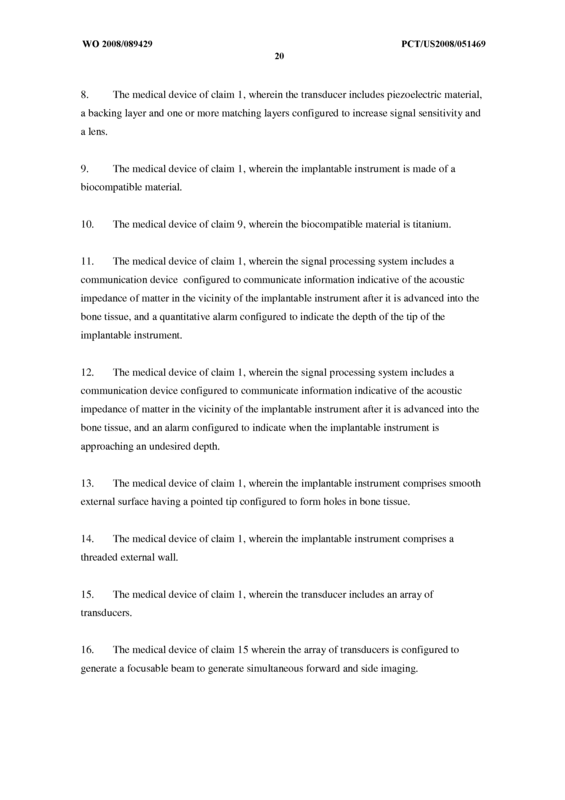 25 The medical device of claim 21, wherein the implantable instrument is made of a biocompatible material. 26 The medical device of claim 25, wherein the biocompatible material comprises titanium. The medical device of claim 21, further comprising a solid cylindrical mass configured to fill the internal chamber when the transducer is not present. 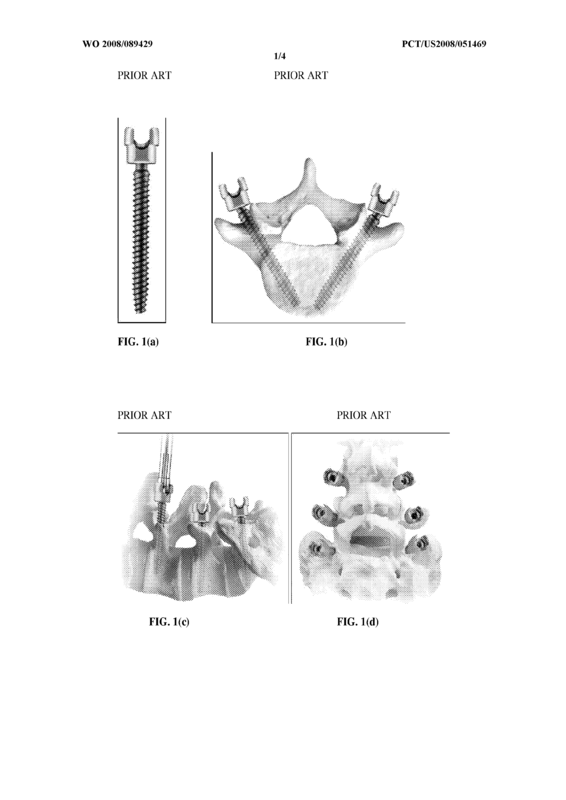 The medical device of claim 21, wherein the implantable instrument is a bone screw. 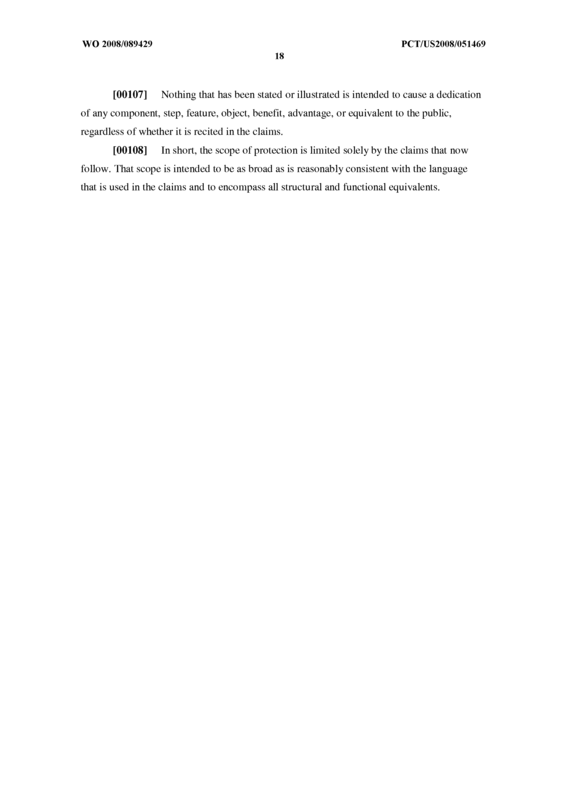 The medical device of claim 21, wherein the implantable instrument is a bone awl. 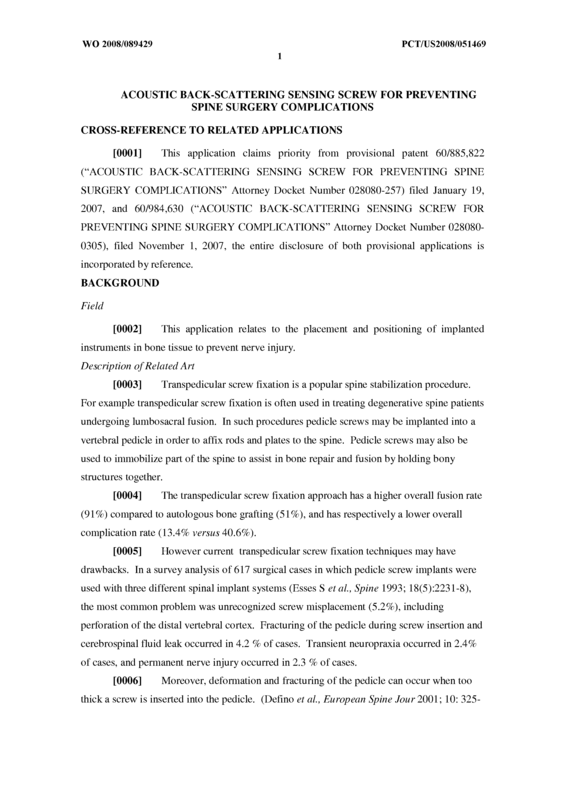 The medical device of claim 21, wherein the implantable instrument is a pedicle probe. The medical device of claim 21, wherein the implantable instrument includes a lens configured to be housed at the distal end of the internal chamber. The medical device of claim 21, wherein the implantable instrument is configured to allow the transducer to be removed and replaced with a solid cylindrical mass. 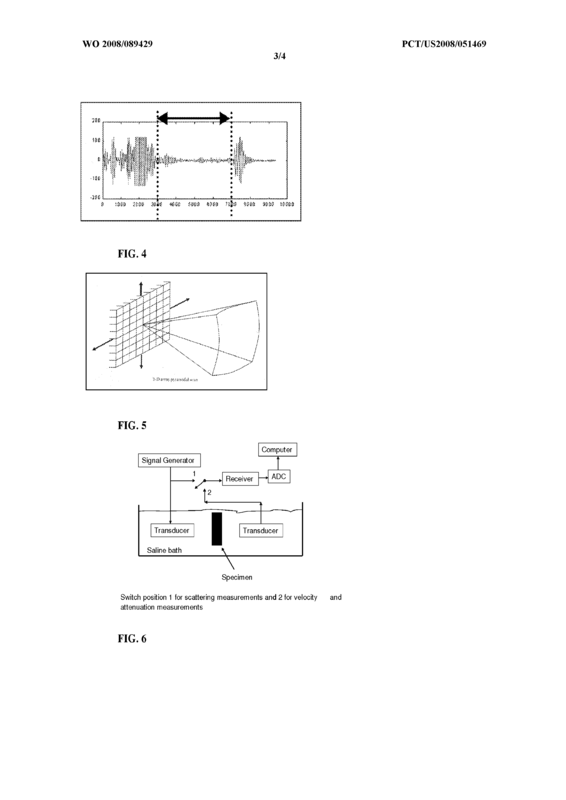 A medical device comprising a transducer configured to be inserted within an internal chamber of an implantable instrument, the transducer configured to transmit a signal and to receive one or more reflections of that signal based on the signals transmitted by the transducer. The medical device of claim 33, wherein the transducer includes piezoelectric material, a backing layer, one or more matching layers and a lens. 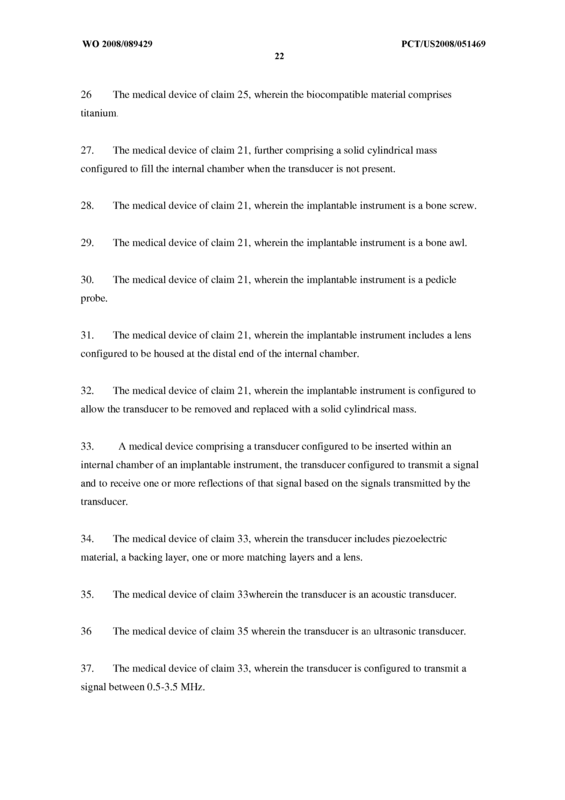 The medical device of claim 33 wherein the transducer is an acoustic transducer. 36 The medical device of claim 35 wherein the transducer is an ultrasonic transducer. 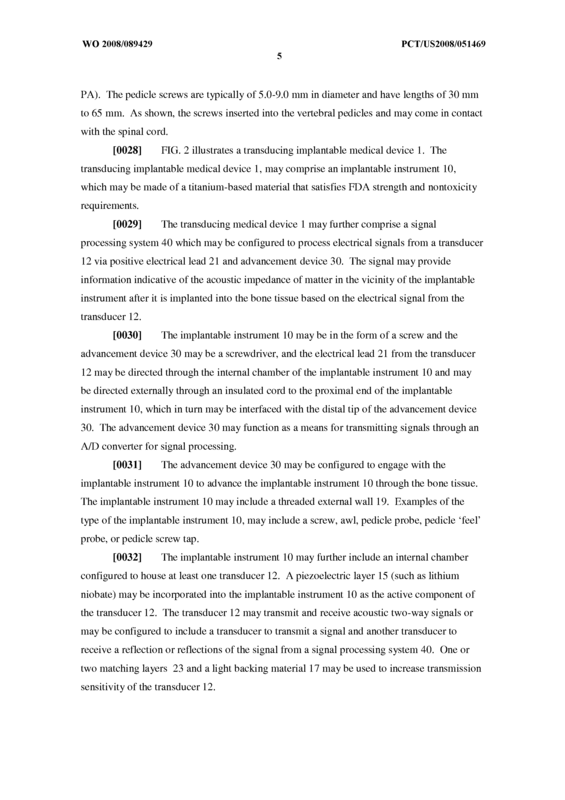 The medical device of claim 33, wherein the transducer is configured to transmit a signal between 0.5-3.5 MHz. 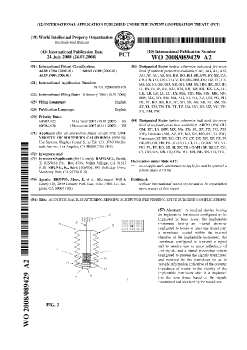 The medical device of claim 33, wherein the transducer comprises a multi-element microarray transducer. 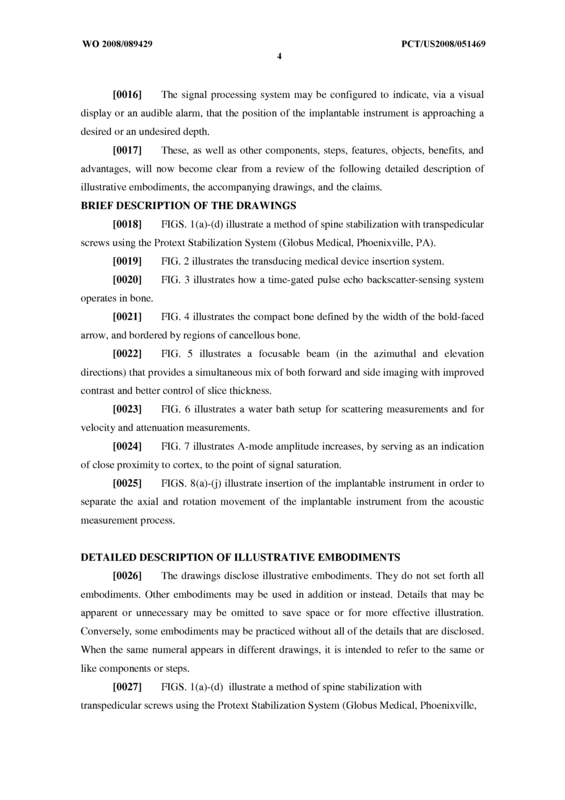 The medical device of claim 33, wherein the transducer comprises a lens. 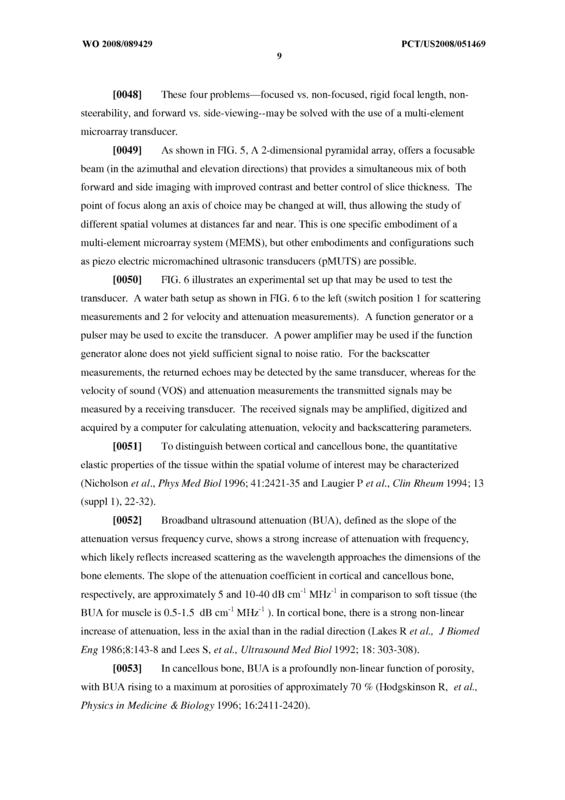 The medical device of claim 33, wherein the lens comprises a material having an acoustic impedance similar to that of the bone. 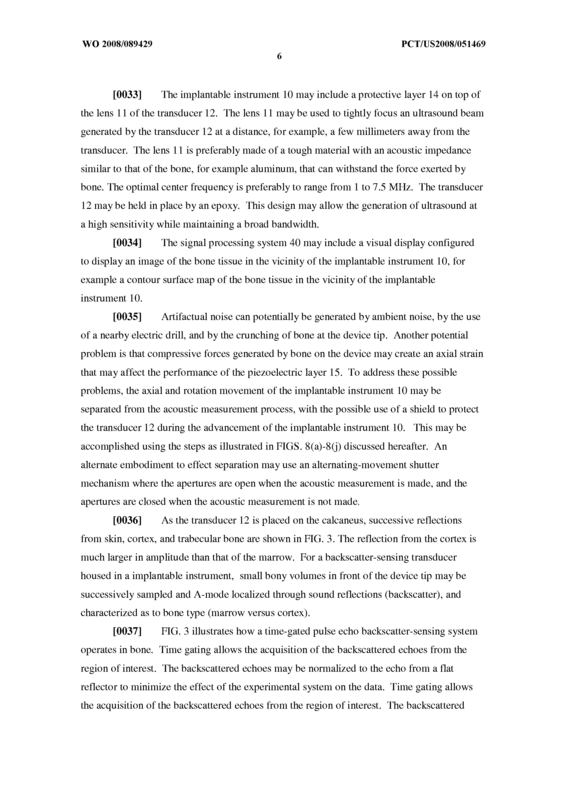 A medical device comprising a signal processing system configured to process signals transmitted and received by a transducer that is inserted within an internal chamber of an implantable instrument, so as to provide information indicative of the acoustic impedance of matter in the vicinity of the implantable instrument after it is implanted into the bone tissue based on the signals transmitted and received by the transducer. 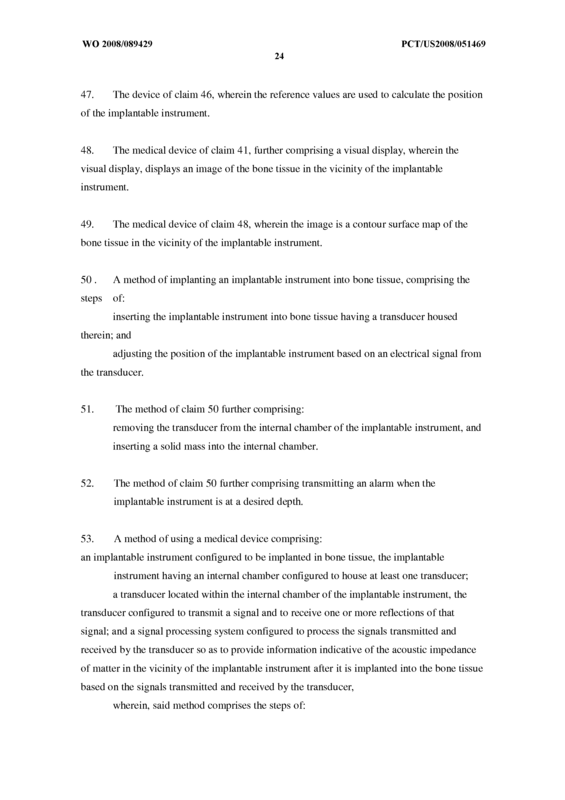 The medical device of claim 41, wherein the signal processing system includes a display configured to indicate the acoustic impedance of the matter in the vicinity of the implantable instrument after it is implanted into the bone tissue and advanced into the bone tissue, and a quantitative alarm configured to indicate the depth of the tip of the implantable instrument. 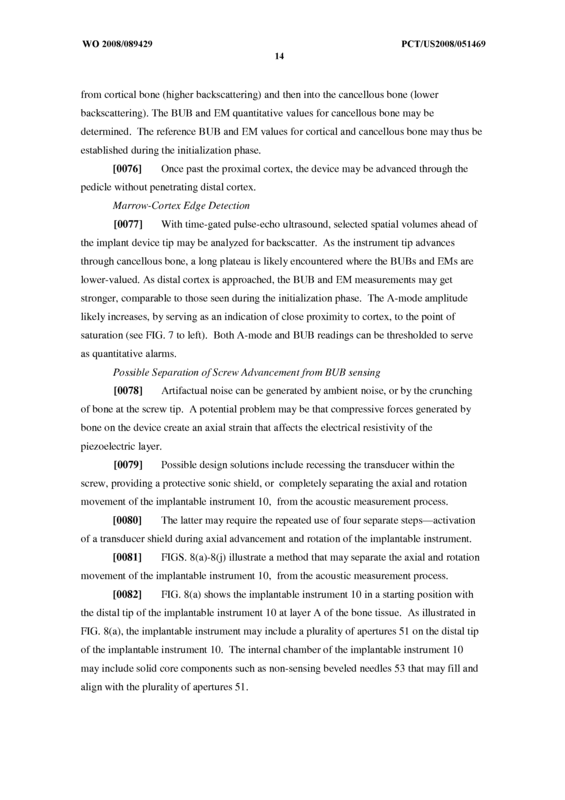 The medical device of claim 41, wherein the signal processing system includes a communication device configured to communicate information indicative of the acoustic impedance of matter in the vicinity of the implantable instrument after it is advanced into the bone tissue, and an alarm configured to indicate when the implantable instrument is approaching an undesired depth. 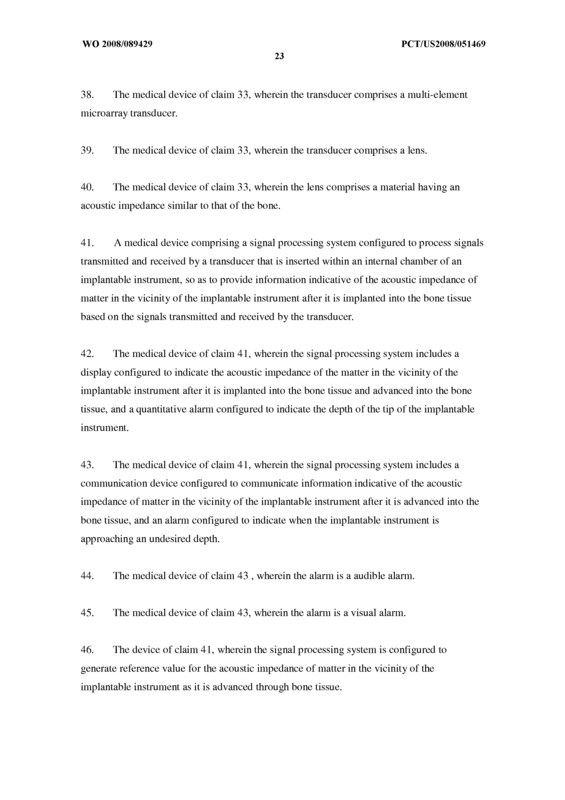 The medical device of claim 43 , wherein the alarm is a audible alarm. The medical device of claim 43, wherein the alarm is a visual alarm. 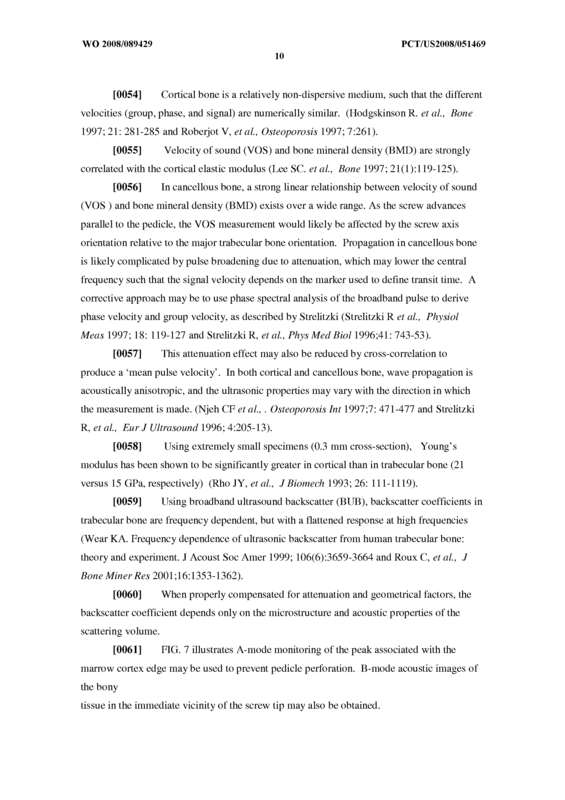 The device of claim 41, wherein the signal processing system is configured to generate reference value for the acoustic impedance of matter in the vicinity of the implantable instrument as it is advanced through bone tissue. 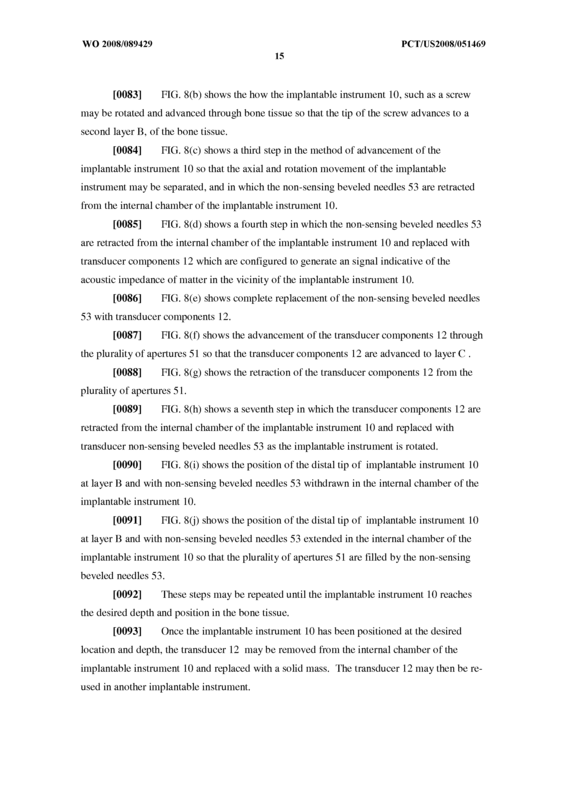 The device of claim 46, wherein the reference values are used to calculate the position of the implantable instrument. The medical device of claim 41, further comprising a visual display, wherein the visual display, displays an image of the bone tissue in the vicinity of the implantable instrument. The medical device of claim 48, wherein the image is a contour surface map of the bone tissue in the vicinity of the implantable instrument. 50 . 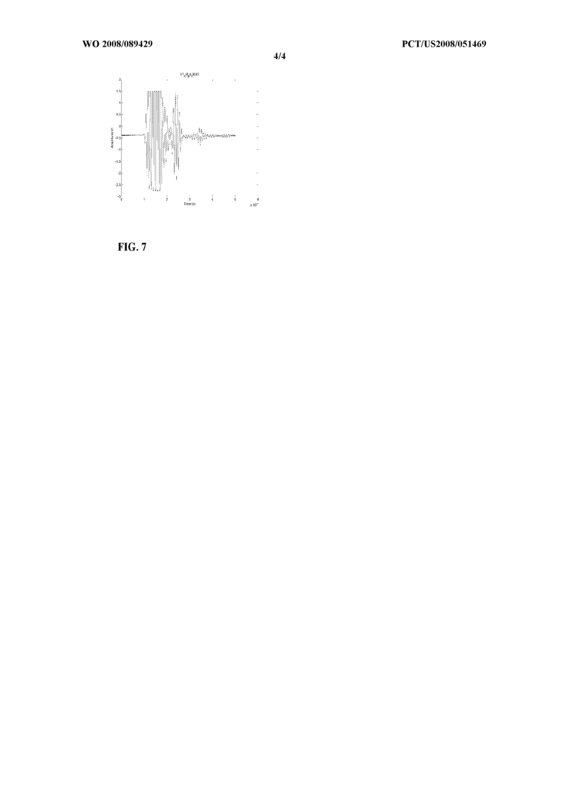 A method of implanting an implantable instrument into bone tissue, comprising the steps of: inserting the implantable instrument into bone tissue having a transducer housed therein; and adjusting the position of the implantable instrument based on an electrical signal from the transducer. The method of claim 50 further comprising: removing the transducer from the internal chamber of the implantable instrument, and inserting a solid mass into the internal chamber. 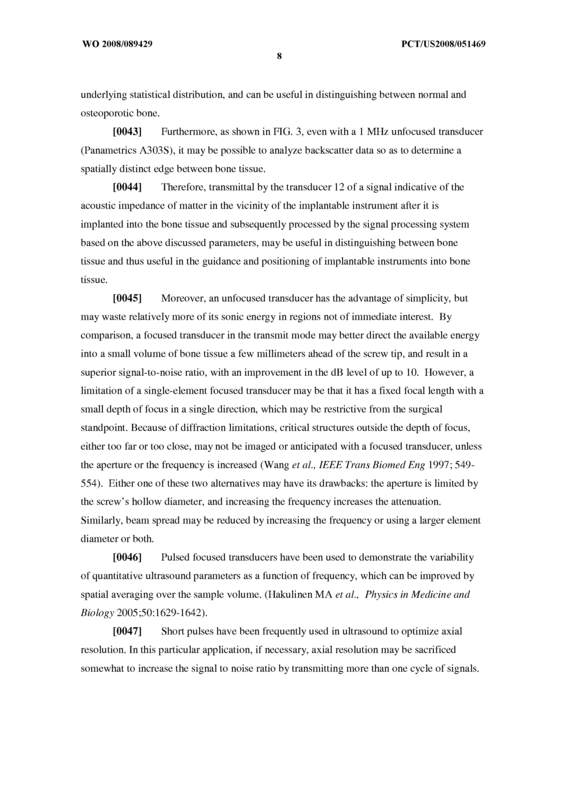 The method of claim 50 further comprising transmitting an alarm when the implantable instrument is at a desired depth. 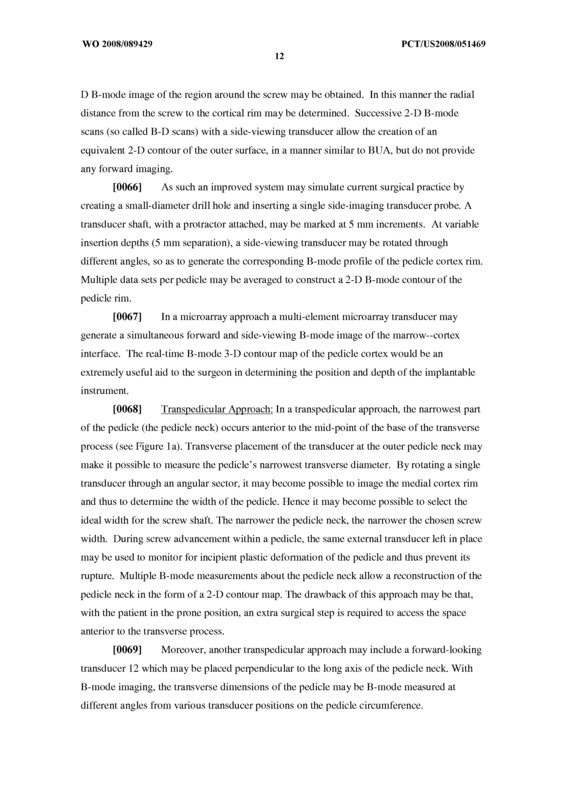 A method of using a medical device comprising: an implantable instrument configured to be implanted in bone tissue, the implantable instrument having an internal chamber configured to house at least one transducer; a transducer located within the internal chamber of the implantable instrument, the transducer configured to transmit a signal and to receive one or more reflections of that signal; and a signal processing system configured to process the signals transmitted and received by the transducer so as to provide information indicative of the acoustic impedance of matter in the vicinity of the implantable instrument after it is implanted into the bone tissue based on the signals transmitted and received by the transducer, wherein, said method comprises the steps of: a. pre-sizing the diameter of the implantable instrument, b. determining the direction of the implantable instrument, c. pre-sizing the length of the implantable instrument, d. initializing the transducer to transmit acoustic broadband ultrasound backscatter values obtained for the outer cortex and marrow, e. configuring the signal processing system to detect the edge of the distal marrow-cortex, f. configuring the medical device to separate advancement of the implantable instrument from values transmitted by the transducer, g. monitoring the signal processing system for complications, h. removing the transducer from the internal chamber of the implantable instrument and inserting an interlocking core in the internal chamber. The method of claim 53, wherein the complications of step g comprise: cortex perforation, and needle injury to key paraspinal structures.